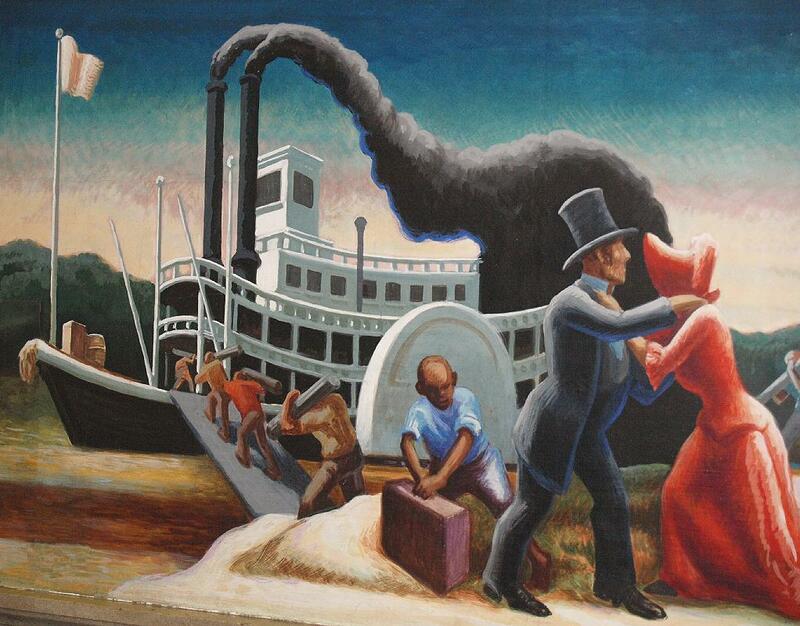 This is a picture I took from one of the other murals in the same room depicting a steamboat landing. The couple on the right is rather spooky . . . the gentleman looks like he might be wearing a mask and if the couple is not beginning to embrace they may be contemplating strangling each other. The lady's bonnet disguises her even more effectively than the nylon hose mask her beloved or her beloathed is wearing. It's also an open question as to whether the gent is arriving or leaving. To see other details from this mural, go to the Tom Sawyer and Huck Finn page - click here. Attached in from eBay, a Thomas Hart Benton painting/illustration on page 75 of FORTUNE magazine June 1930.Individual issues of the magazine are expensive so it was fortunate that this page was offered at a reasonable price. 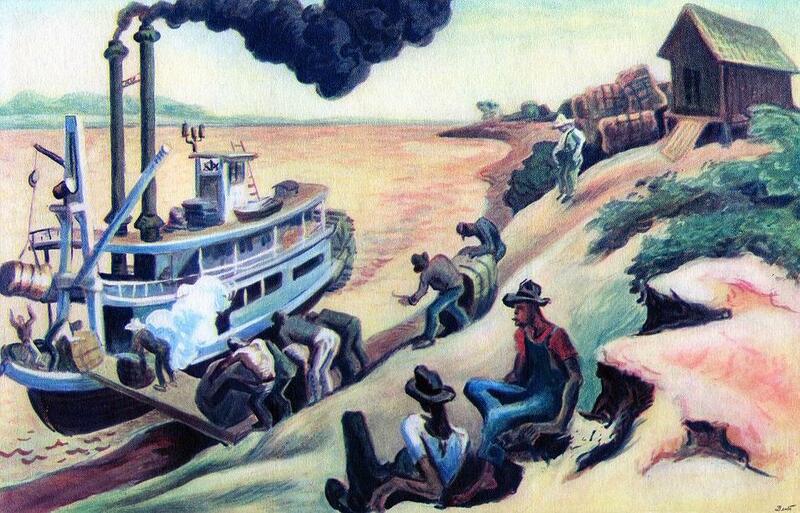 1946 painting by Missouri artist Thomas Hart Benton entitled MISSISSIPPI TOWBOAT of the D.R. WELLER. This was featured on the cover of a corporate magazine called THE LAMP Feb 1946 published by Standard Oil Co. Colors a pretty intense, more in the "fine art"painter's palette than the illustrator's. Originally the City of Pittsburgh, she was sold to Standard Oil Company of Louisiana when practically new and renamed D. R. Weller. Captain Elmer C. Good probably was her first master, while J. F. Clark and Vincent Dugas were pilots and Hugh L. Edwards chief engineer. Captain Sewell Smith was master in June, 1926 when she hit a bank stern-first in a fog and disabled her rudders. 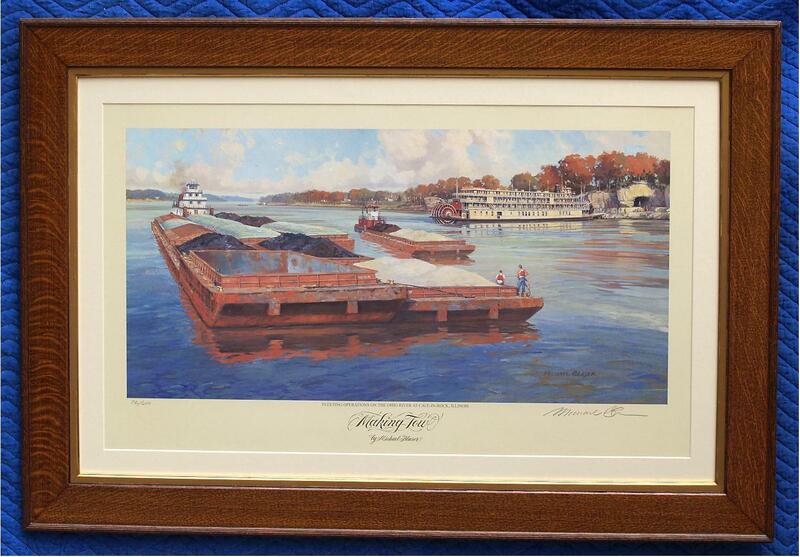 She drifted from Brown's Field to Kemp's Bend with a loaded tow before the Federal Barge Line towboat Vicksburg came to her rescue. Captain George S. Knabb, originally from Cincinnati, became master later and in 1939 got a 20-year service pin from Standard Oil. In later years Captain Joseph DeCareaux was master, with Felix Guichet, chief engineer and Lawrence Babin, second engineer. The boat was sold in 1949 to Marine Salvage and Equipment Company and then to George W. Whiteman of Gretna, Louisiana and dismantled in 1950. 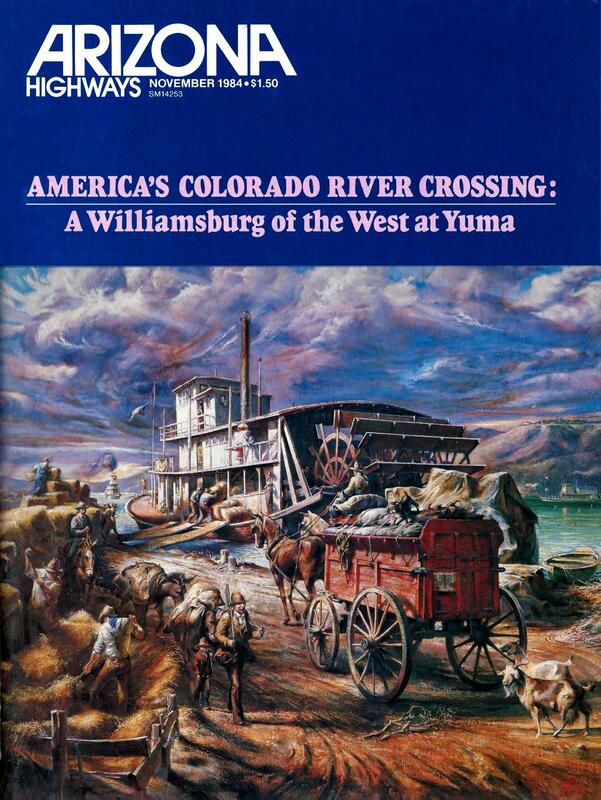 Arizona Highways ran this illustration on the cover of their November 1984 issue, for a story about paddle wheelers on the Colorado River. One of my favorite paintings by Michael Blaser is MOON RIVER which is rich in romance and nostalgia . 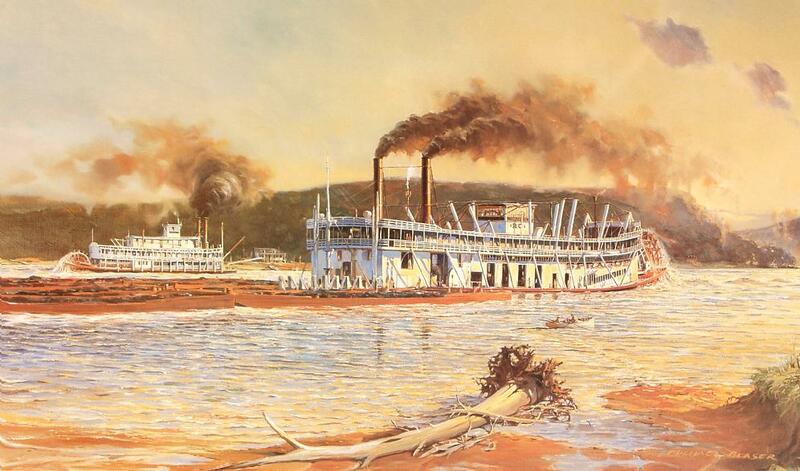 . .
"The steamboats BELLE MEMPHIS and BAYOU SARA pose for the artist on a moonlit night along the Lower Mississippi. 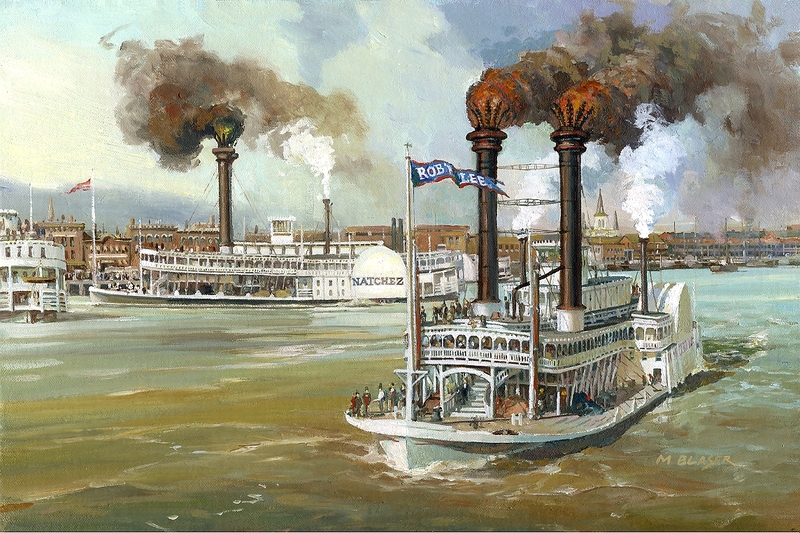 The Anchor Line packet steamers of St. Louis and New Orleans built steamboats that epitomized a great antebellum steamboat. Their boats were all named after cities along the river. The formal "CITY OF" always appeared ahead of the name, but crews often substituted, such as in the case of CITY OF MEMPHIS. It became known to all on the river as BELLE MEMPHIS. In addition to these lovely lines and excellent accommodations, the Anchor Line boat was recognizable from miles away because of their large, ornamental tin anchors that were placed between the stacks. The period between the end of the Civil War and the turn of the century is remembered for an unpredictable cotton market, and the Anchor Line suffered more than her share of sinkings on the Lower Mississippi. The BELLE MEMPHIS was snagged and damaged beyond repair. 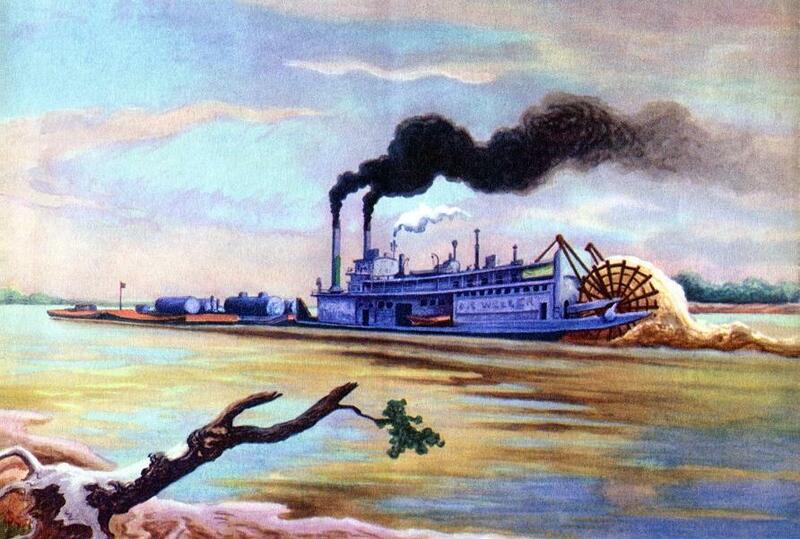 The BAYOU SARA was lost to fire on the levee at New Madrid, Missouri." Michael Blaser's painting of Missouri River town Boonville, MO as it looked in 1875. The Joseph Kinney was named for local steamboat man Captain Joseph Kinney who operated steamboats in out of Boonville on the Missouri River for over a quarter of a century and built a mansion called Rivercene across the river from Boonville. This captures the feeling of so many Missouri river towns with the hills and foliage; the homes, church, commercial buildings and the warehouses along the waterfront. 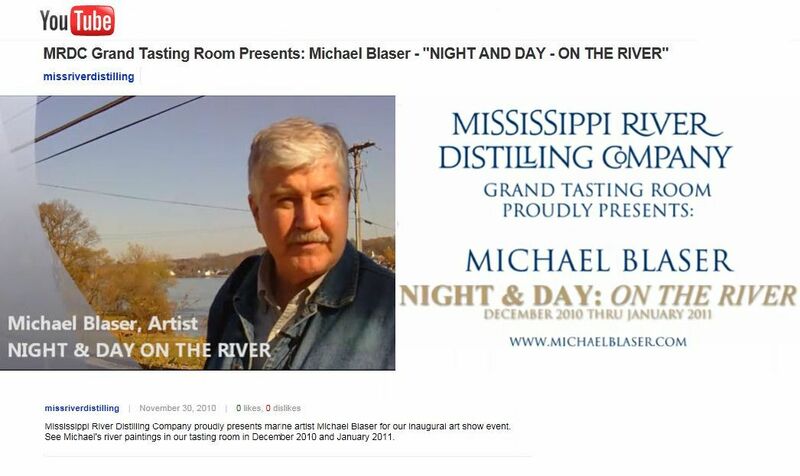 I'd love to see Michael Blaser paint Hannibal, MO during the 1840's or '50's before Sam Clemens lit out to fulfill his destiny. The painting above is one of Michael Blaser's best. I have one of the large prints. Below is link and text off his site to that print which might attract visitors to your site who feel like it's time for them to buy a nice big display piece suitable for framing and fantasize over. The old cotton packet Kate Adams of Memphis was brought to the Upper Ohio in 1926 for the packet business that was running between Pittsburgh and Cincinnati. 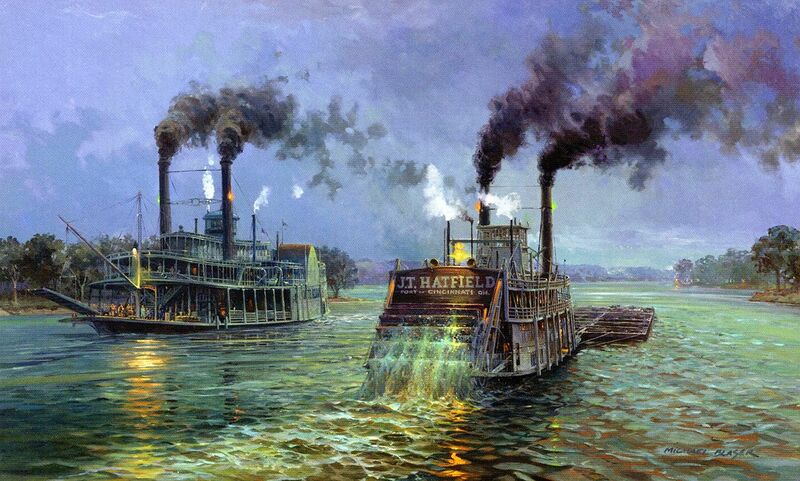 The sternwheel towboat J. T. Hatfield ran coal from Charleston, W. Va. to Cincinnati for over 30 years. 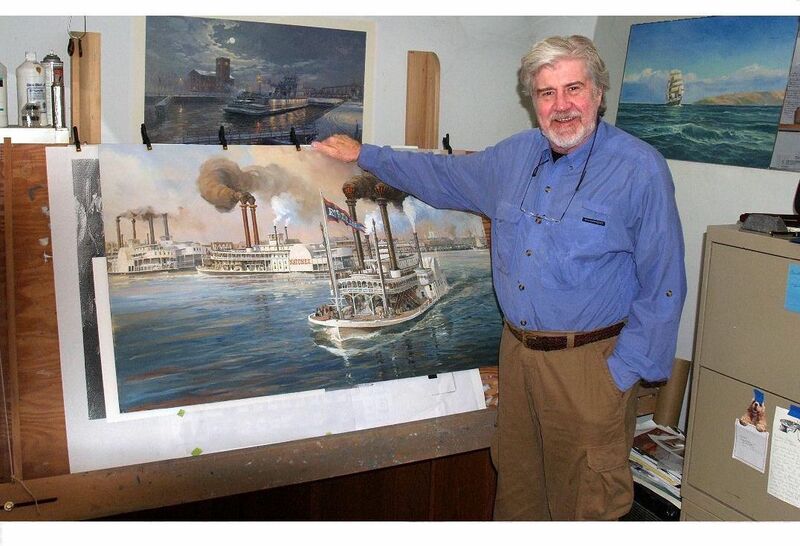 Michael Blaser in his Bettendorf, Iowa studio with a work in progress: the Mississippi River at New Orleans on June 30, 1870; the beginning of the race between the ROB'T E. LEE and the NATCHEZ. 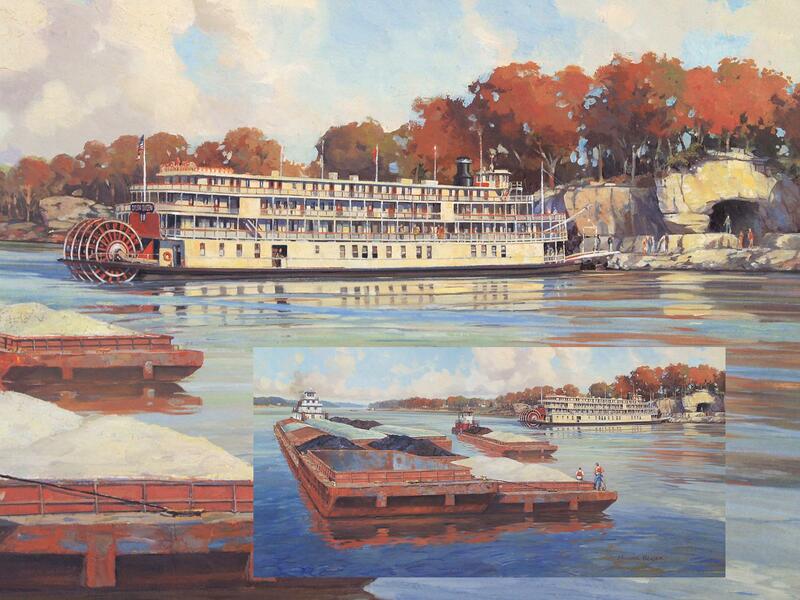 Michael Blaser's painting entitled MEETING BELOW THE BEND of the big towboat SPRAGUE and the packet EVANSVILLE. Attached photo of a painting I just bought from Michael Blaser who made this as a study for a large canvas he will begin soon depicting the start of the 1870 race of the Natchez and the Rob't E. Lee at New Orleans. 10 1/2 X 15 1/2 (size of canvas). I provided Michael with a copy of my old stereo photo of the Lee at a N.O. landing which he used as reference for the feathers on her stacks. The perspective on the Lee is complex and "in person" it feels as though the boat is going to sail right out of the frame. I took Blaser's painting out of the frame and made some scans at various sizes. This is the pint-sized one. "Vive la bateaux à vapeur!" The notorious bandits the Harpe brothers used Cave-in-Rock as headquarters and a trap for hapless flatboaters floating south circa 1800 who were tricked into assuming that the Harpes were extending and invitation to hospitality instead of robbery and murder. The Cave was used as a location in several movies about Ohio River pirates . . including Disney's saga of Davy Crockett and Mike Fink battling the pirates. In MGM's HOW THE WEST WAS WON Jimmy Stewart is lured into the pirates' trap.